Holy Moly it’s happening again! Bike Rave is a free event – but we ask you to bring along a cash donation for charity Bicycles for Humanity. We will be collecting throughout the evening. We have curated a whopping 4.5 hour mix from some very talented producers for this Bike Rave. The mix is full of pumping party tunes to keep you dancing all night long. You should download this and put it onto an mp3 player. 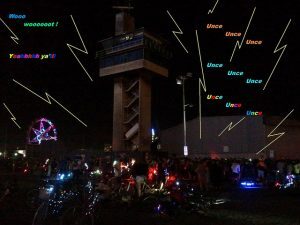 The soundzzzz are here: https://soundcloud.com/bikeravemelb/bike-rave-2018.